Re-Tubing | Perfex International Pte Ltd - Radiators, Charged Air Coolers, Heat Exchangers and Oil Coolers for power generation and other industries. Over long periods of operation and depending on its application, shell and tube heat exchangers can have excess pitting, advanced tube sheet wall loss, and leaks, which may prohibit reinstallation. 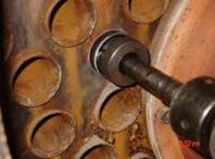 Leaking tube-to-tube sheet joints can cause cross contamination of fluids, resulting in malfunctioning, decreased utility and increased maintenance cost. Our extensive experience in re-tubing, available expertise, and resources provide a solution to our customers.